I heard somthing like that.The meat was asian cocatoo "srug"
No meat lovers in MY STATE! 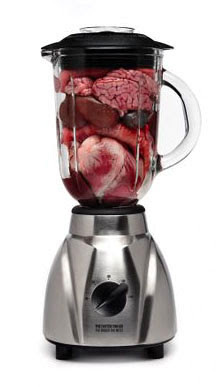 That picture wasn't very creepy until I thought about what it would look (and sound) like if the blender were to be turned on. *throwsupinmouth,swallowsitback* I really could have done without that gruesome visual. This is very mysteriously interesting! I think that maybe someone is just trying to get rid of their billions of dollars in a very generous way. But isn't it sad if that's the case, and everyone thinks it's poisonous, so they just leave it there to rot? Still, those people are doing the right thing by not letting their pets eat the meat. You never know what that thing is, or what it contains. Another possibility is, a gang of silly rich people (Who maybe became rich because they steal money), want to play a prank and see how long it would last before they get caught. Maybe they escaped prison.. and want to make the most of it before they get caught. Soooo many possibilities. I wonder what's really doing it... This is really interesting. BTW: Is it so hard for those people to put a night-vision camera on the tree or something? I wish they would do that! I'm dying to find out what it is! I don't think that picture is gross at all. i love that! its so awesome! probs a trap to lure a vamp into some phsyco's ands so he can attempt to kill it and be taken by the sesative vamp instead, even though the poor vamp regrets killing and innocent yet phsyco mortal for nothing. Actualy, I think it's pretty cool! The reason no camera has been installed is that the Framingham police are dealing with more pressing matters. Additionally, no state or national lab would deign to test the meat for toxins, and there has been no more meat left for quite some time now, so the case has been dropped.